Multiple platforms reviews. One VERDICT. CaseFox does it all, Only better. Casefox Works On All Major Browsers. The expert in legal billing software. Easy invoicing based on previously recorded time entries/notes. Seamless integration with Xero Accounting. Export invoices to QuickBooks. Bulk Invoicing. Everything that is needed to build a better practice. No Installation, upgrade, or expertise required. We deliver exceptional customer service via email/phone. Use industry standard methods to protect your data against system failures. Generate reports, analyze data you need to improve your practice. Get paid faster and record payments automatically via client portal. In addition to mobile apps, use SMS for entering time/expense entries. Access from any device anywhere, anytime. Access CaseFox full features from your desktop, tablet, or mobile friendly application. CaseFox offers Android and iOS mobile apps for daily use important features and chrome extension for Add Time/Expense entries so you never missed the important time entry. You can even enter your time by sending a simple SMS message. See how you can use Casefox IOS App, Android App and Chrome Extension. Our customers love our product. "Our firm has been using CaseFox now for a few months, to accommodate the needs of one of our clients who requested LEDES compliant invoices. However, we have been so pleased with CaseFox that we have migrated all of our timekeeping/invoicing over to this platform for all of our clients. The user interface is easy to operate, and there are several features which have improved our timekeeping, invoicing and payment tracking efficiency. We recommend the service." Nevrivy Patent Law Group , P.L.L.C. I'll make sure to let the Attorneys know how awesome and user friendly this program is! "The company I work for needed a timekeeping/billing system and we came across Casefox on the Google apps. We are extremely pleased. The system is very fast to work with and it was super easy to learn. Most importantly, we are very pleased with their customer service. We have asked for many small changes to meet our needs and they immediately responded. Thank you!" I love your product! Thank you for such an affordable option for record keeping. We are located in Belarus where many clients speak Russian and Belarusian, which are both written using the cyrillic alphabet and we do the time entries for them in Russian accordingly. One of the great advantages of Casefox for us is that if we enter the time notes in cyrillic letters - it shows up just like we entered it in the system itself. Very few if any cloud solutions can handle Russian, but Casefox can and this is a godsend. One of the best things about this time tracking application is it's ease of use. It's clean and clear interface make it a much more user-friendly affair for your staff members leading to better billing and accounting methods. "CaseFox timekeeping, billing and trust accounting law firm software lives on the other side of the legal business from complex and expensive software systems. A simple system designed for individuals and smaller offices, This software for lawyers has a mobile-friendly interface, and can, among other things, track both billable and non-billable hours and expenses, monitor unbilled hours, late payments and handle trust accounting, tasks management and case notes/case tracking. It also integrates into email. Small version is free, pay version is not expensive." "If you are looking to start up or change an existing system, take a look at CaseFox. It might be the animal for you." 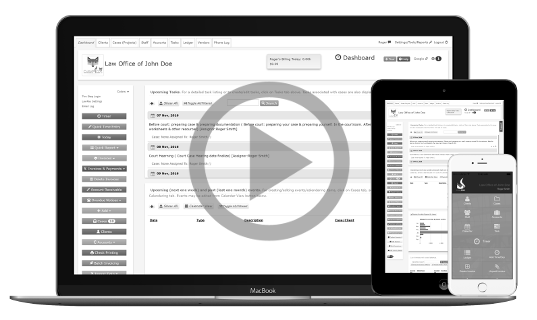 "An application that is aimed both at law firms and freelance lawyers, CaseFox timeeping, billing and trust accounting software makes it easy to invoice clients accurately by tracking the hours that are spent on any case." "Si la facturación que realizas se basa en las horas que inviertes en el desarrollo de un trabajo, Casefox es una herramienta que tienes que tener en cuenta." "CaseFox's developers assumed that lawyers track their time in different ways ranging from paper to timers to automatic time capture programs. Thus, instead of creating time-tracking tools, the developers instead focused on making time and expense entry and bill creation as efficient as possible..."
Impressed so far! CaseFox is the one Case Management program that has just what we needed. It is web based, so no high cost for network upgrades and everyone can use it anywhere. It offers the backend features such as accounting without the additional fees most providers charge. It plays well with Google Apps that we use in our Firm. Great Job CaseFox!!!! CaseFox has proven to be a most valuable tool in my practice. I am recommending the site to colleagues who are looking for an efficient, simple, user friendly and cost effective billing program. Appreciate all your updates and improvements. Thanks also for your superb customer service. I love this program. It is very user friendly. CaseFox Integrates With Uselfull Tools. Access full featured from basic free plan, No Credit Card Required. Copyright 2011-2018 CaseFox . All Rights Reserved.